"Written by engineers for engineers (with over 150 International Editorial Advisory Board members),this highly lauded resource provides up-to-the-minute information on the chemical processes, methods, practices, products, and standards in the chemical, and related, industries. " "High acclaim from worldwide authoritative journals . . .an ambitious work indeed. . .a valuable addition to many college and industrial libraries. 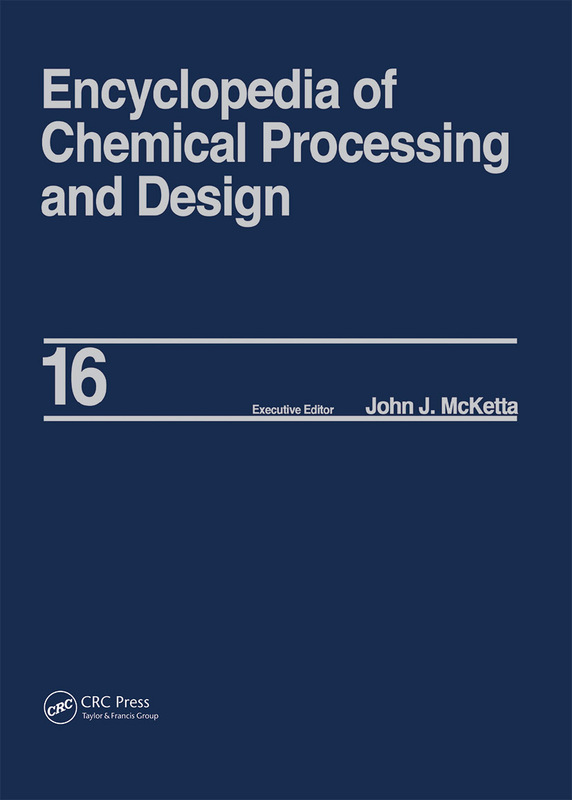 . . . . .highly recommend[ed]. . .to any student of the chemical process industries. . .provides a valuable starting point for any specific design-related project. " ". . .a useful and valuable addition to all technical, professional, and university library collections. " ". . .A wealth of information is presented on a number of processes, each keyword is followed by extensive bibliographies, unit operations are illustrated by practical problems, and case studies are presented of design exercises. " "A very attractive series of volumes. " "Dimensional Analysis, I. H. Silberberg and John J. McKetta Dimethyl Terephthalate, R. H. Baldwin and H. A. Leipold Distillation, W. L. Bolles, and James R. Fair Distillation, Azeotropic and Extractive, C. D. Holland, S. E. Gallun, and M. J. Lockett Distillation, Batch, G. A. R. Trollope Distillation Control, F. G. Shinskey Distillation, Crude Stabilization, R. N. Maddox, J. H. Erbar, and A. Shariat Distillation, Estimates for Naphtha Cuts, D. B. Broughton and K. D. Uitti Distillation, Flash, C. J. Liddle Distillation, Optimization, W. T. Mitchell Distillation Simulation, A. Chou, B. L. Bauman, and A. M. Fayon Distillation, Steam, R. W. Ellerbe Distillation, Thermally Coupled, Walter J. Stupin and F. J. Lockhart Distillery Wastes-Disposal and By-Product Recovery, V. Pachaiyapan Divinylbenzene, W. G. Kingsley, L. Steib, and R. Partos Doctor Sweetening, Kenneth M. Brown Drawings, Engineering, Wm. P. Southard Drilling Fluids, N. K. Tschirley Drilling Practices, Adam T. Bourgoyne, Jr. Drives, Adjustable Speed, Ernest F. Cooke Drying of Fluids with Adsorbants, G. E. Hales "